While you probably already know that chocolate isn’t meant for man’s best friend, other pet toxins may surprise you. For example, did you know that ibuprofen is one of the most common dangers to pets? A report from the ASPCA Animal Poison Control Center (APCC) gives pet owners the lowdown on which toxins were most commonly ingested by pets in 2016. To keep your pet from being accidentally poisoned, be sure to keep the following products out of reach. All too often, household items -- such as glue, paint, cleaning supplies, etc -- are lapped up by pets. The ASPCA says it receives tens of thousands of calls each year about poisonous household items being ingested by pets. To keep your efforts to spruce up the house from poisoning your pet, be sure to put products away as soon as you finish using them. You can also consider opting for pet-friendly cleaning product alternatives, such as baking soda, vinegar, and lemon juice. Despite being made specifically for pets, certain veterinary products can pose a danger to furry family members. Over-the-counter supplements and prescription pain medications are often formulated to appeal to pets’ palates, which can tempt some pets to ingest too much. The number of calls regarding over-ingestion of veterinary products has risen in recent years, accounting for 9.3% of poison-related emergency calls to the APCC in 2016. To keep pets safe, pet owners should be sure to keep bottles and packages containing tasty medication away from pets. Human foods like onions, garlic, grapes, raisins, and alcohol are among the more well-known pet toxins, but another product has caused “food” to move up a spot on APCC’s annual list of pet toxins. Xylitol, an artificial sweetener commonly found in sugar-free products and even some types of peanut butter, has been to blame for a rising number of calls to the ASPCA’s poison control line. Nearly 17% of calls to the AAPC involved OTC products including medications, makeup, and body care products. The most commonly called-about product is still ibuprofen, according to the report. Because a dog’s metabolism is different and faster than a human’s, even small amounts of ibuprofen can cause a rapid spike in insulin levels. For this reason, pet owners should make sure never to leave bottles of aspirin or other pain medications lying around the house. 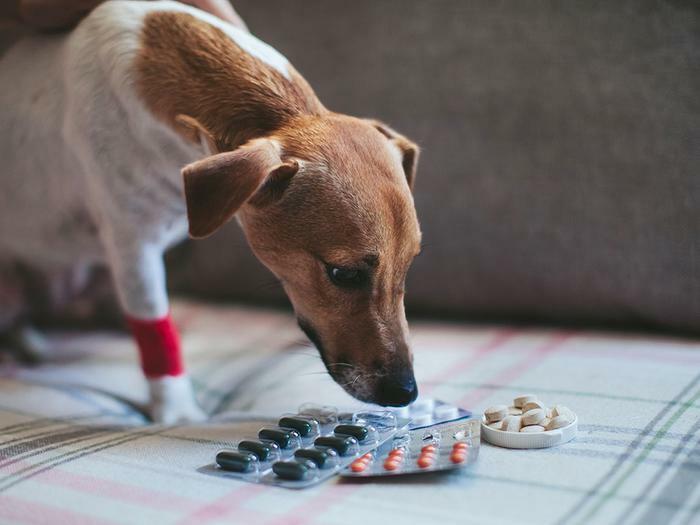 Drugs commonly prescribed to humans -- including heart medications, antidepressants and ADHD meds -- are a common danger to pets, accounting for nearly 17% of all cases at the APCC. Pet owners with prescription medications in their home should always store medications in a safe place, such as behind a closed cabinet door. If you think your pet may have ingested a potentially toxic substance, contact your veterinarian or call the ASPCA 24-hour APCC hotline at 1-888-426-4435.